It was with profound shock and grief that the banking community, his friends and relatives received the sad news of the untimely demise of Ramanathan Nadarajah on 24 June 2018. He was 74 at the time of his death. Born in Thirunelveli, North of Jaffna, he had his primary and secondary education at Parameshwara College Jaffna, one of the leading colleges, in Jaffna. As a student he excelled in studies and graduated from the University of Ceylon (Peradeniya) with a degree in double Mathematics and Physics with a Second Class Upper. ‘Nada’ as he was fondly called by his friends, started his banking career by joining Bank of Ceylon as a Staff Assistant Grade – II. He obtained extensive experience in almost all areas of banking which made him a complete banker. He received the widest possible exposure. His hard work, dedication and commitment earned him lots of respect and admiration from all. He was well-known for ‘Paying attention to detail, and added value in no uncertain terms to the bank’s credit evaluation process. He was a much sought after resource person for seminars, especially on Bank Lending. He kept on moving up the bank’s hierarchy to be a Deputy General Manager of Bank of Ceylon. He passed the Diploma in Banking Examination conducted by the Chartered Institute of Bankers London and was awarded with its Associateship. He then went on to be elected as a Fellow of the Chartered Institute of Bankers, London (FCIB) in recognition of his services to the banking industry. He also completed his Masters’ in Business Administration from the University of Colombo. After his retirement from Bank of Ceylon, he joined Pan Asia Bank and was appointed as its Managing Director / Chief Executive Officer within a short period of time. Thereafter, his services were sought to help Seylan Bank to come out of the crisis it was in at that time. He was appointed an Executive Director and was placed in charge of the Bank’s Operations. He helped the bank out of the crisis situation it was in and put it on a more stable footing. He also functioned as the Chairman of its subsidiary Seylan Developments PLC at that time. 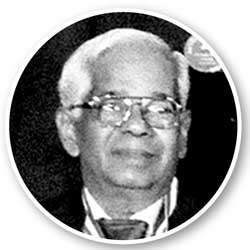 He was the inaugural President of the Primary Dealers Association in Sri Lanka, a Past President of Banks Hindu & Tamil Literary Association, Past President of Association of Professional Bankers –Sri Lanka (APB) and a member of the APB Fund Management Committee. He was awarded with the Honorary Life Membership of the APB in recognition of his contribution to the APB. He was a member of the Council of Advisors of APB and a member of the Forum of the Organisation of Professional Associations of Sri Lanka for several years where he served in the Panel of Industrial Experts, for the Annual Report Awards Competition conducted by the Chartered Accountants of Sri Lanka. He was a man of undoubted integrity and a fountain of knowledge. He had a very wide circle of friends in very many specialized fields. Among them were Sinhalese, Tamils, Muslims and others. For him race or religion of a person didn’t matter. The ringing tones on his mobile phone was always a popular Sinhala Song. He was the absolute role model for persons believing in communal harmony. A number of people made it a habit to seek his advice as he gave them sound and sincere advice. ‘Nada’ was a gentleman of the highest order. He was an epitome of simplicity humility and modesty. He was always wearing a broad smile and greeted everyone by saying ‘God Bless You’. He was keen to help anyone who needed assistance. His friends, relations, colleagues, superiors, subordinates and all loved and respected him. Our association with Nada dates back to many years. I had the privilege and pleasure of having been a close friend and colleague of his for a number of years at Bank of Ceylon and later at the APB. His demise is not only a loss to his family, friends and fellow bankers, but also to Sri Lanka’s banking industry. Nada’ was very fortunate to have Umayal as his wife. She was always there to support him and never grumbled about his late hours at the bank. They were a happy couple and were always together except when he was away on duty. He leaves behind his devoted wife, two daughters Mathangini and Ajahini and three loving grandchildren. Everybody will miss him forever. May his soul attain Moksha.